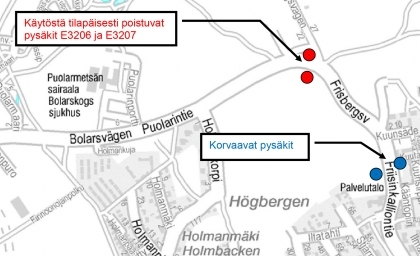 The "Kalliolähde" bus stops E3206 and E3207 located on Puolarintie will be closed form 28 October to 27 November due to construction work. The closest stops are the "Kuunkatu" stops E3204 and E3205 at the Kuunkatu intersection on Friisinkalliontie. The stops are served by routes 10, 10K, 19, 31, 121A, 121AT, 154N, 195 and 543. The map below shows the closed stops in red.